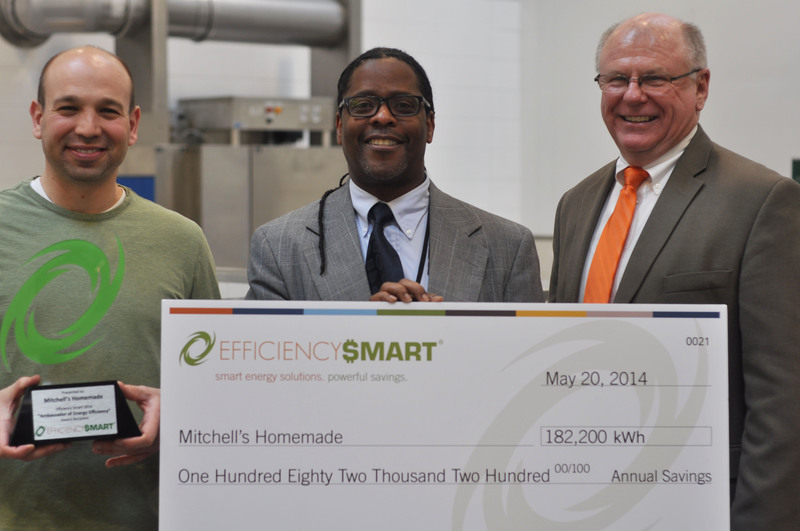 Mitchell’s Ice Cream received the “Energy Ambassador” award from Efficiency Smart in recognition of their extensive installation of energy efficient equipment resulting in major savings in their kilowatt hour usage. That savings is pretty sweet, especially for business owners Mike and Pete Mitchell. 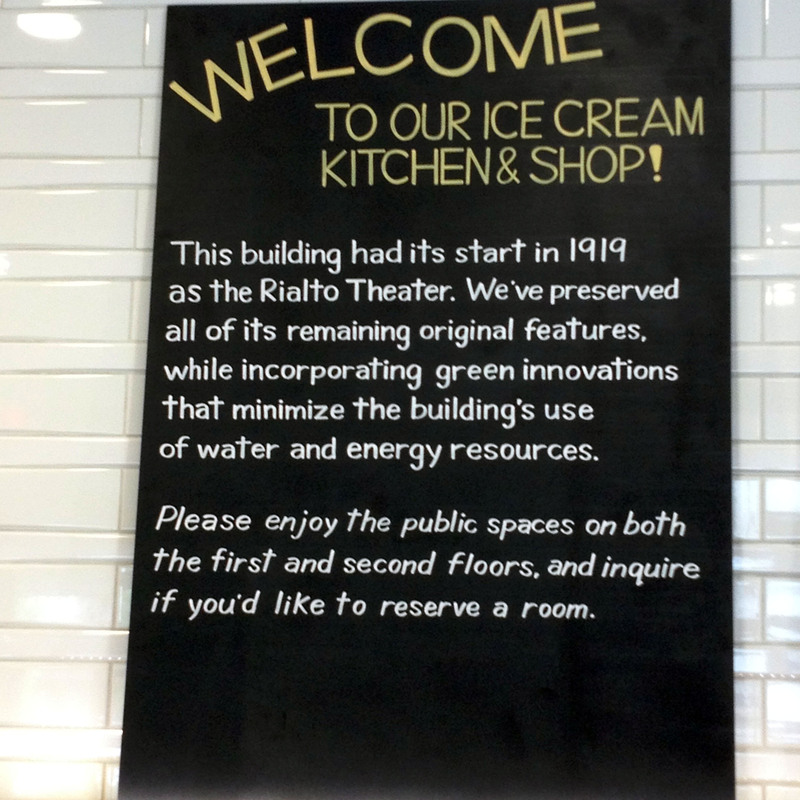 Paying Homage to the previous occupant of this building, a sign in the Ice Cream Shop remembers the Rialto Theater. The efficiencies are evident as you look throughout their store at 1867 W. 25th. The store is equipped with LED lighting throughout, skylights, windows with a solar heat gain coefficient (SHGC) rated better than standard ENERGY STAR level, efficient refrigeration compressors and controls, LED light fixtures that are controlled by daylight sensors, high efficiency HVAC system and large commercial fans to allow the cooling temp set points to be increased. The upfront commitment will add up to a savings of 182,200 annual kilowatt hour savings and an annual CO2 reduction of 341,300 pounds! Not bad. As a Cleveland Public Power customer, Mitchell’s was introduced to Efficiency Smart in an effort to offer their business cost saving efficiency measures that helped their bottom line. The Ambassador of Energy Efficiency Award recognizes entities that have completed substantial energy efficiency projects. To be considered for the award, companies must be an electric customer of a utility that partners with Efficiency Smart and complete a project that results in significant energy savings for the community. Get a 4-Pack of CFL bulbs free! Save $ when you like Efficiency Smart on Facebook. Throughout the month of November, Cleveland Public Power’s (CPP) partner Efficiency Smart will give customers of CPP a four pack of compact fluorescent light (CFL) bulbs for free if you “Like” Efficiency Smart’s Facebook page. That’s all it takes and you can begin saving on your monthly electric bill. 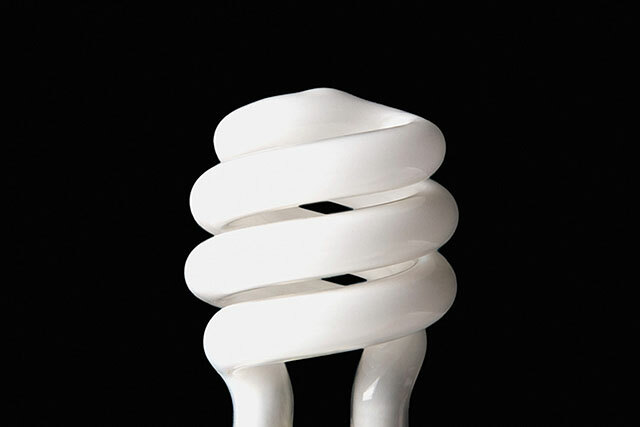 If you don’t believe me, just log on and hit the “Like” button, and then click on “Get Free CFLs “. So just in time for Thanksgiving you can begin saving approximately $2 each month, which equals a total savings of $24 a year and $160 for the life of the bulb. September 25, 2013 (COLUMBUS, OHIO) ––When Adolph Thomay’s refrigerator was made, the United States was in the midst of the Great Depression, Franklin D. Roosevelt was president, and gas cost just $0.10 per gallon. Thomay, a Cleveland Public Power customer, had the oldest refrigerator collected from the municipal electric systems that participate in Efficiency Smart. The statewide “Ohio’s Oldest Fridge” contest was sponsored by most of the state’s electricity providers as part of an effort to promote an appliance recycling energy efficiency initiative. 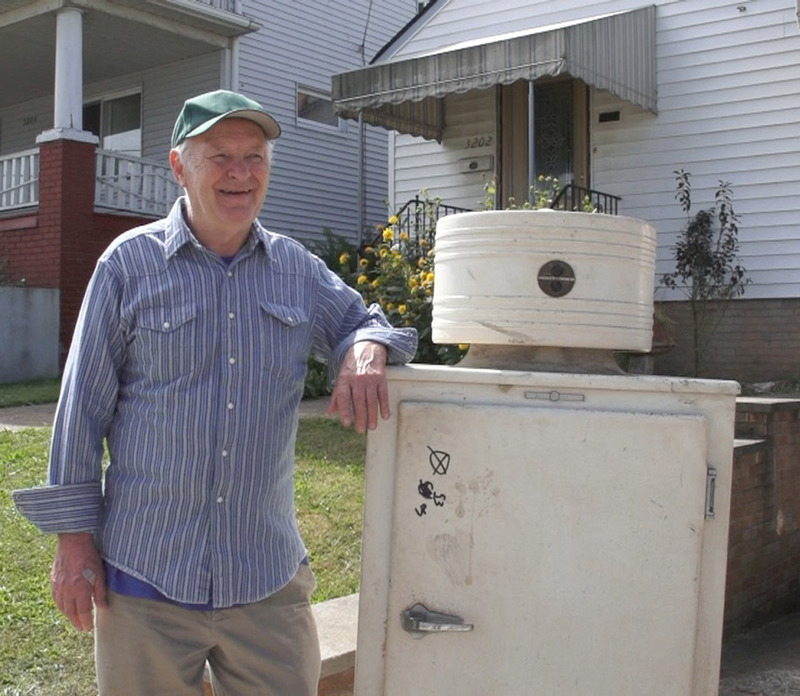 Adolph Thomay was one of three Ohio winners of the “Oldest Fridge” contest. At the statewide level, two 1930 refrigerators belonging to residents in Upper Arlington, near Columbus, and Middleburg Heights, also in the metro Cleveland area, tied for the title of Ohio’s Oldest Fridge. Thomay’s 1934 General Electric refrigerator was declared the oldest model collected from the 47 Ohio municipal electric systems that participate in Efficiency Smart. Thomay scheduled his old refrigerator for free pickup and recycling through Efficiency Smart’s appliance recycling initiative after learning about the contest and initiative through an Efficiency Smart mailing. Thomay will receive a $250 prize for owning the oldest refrigerator picked up in Efficiency Smart’s service area in addition to the standard $50 incentive that every customer receives for participating in the recycling initiative. Thomay’s parents purchased the refrigerator secondhand in the 1950s, when they immigrated to the United States from Czechoslovakia. The refrigerator was later passed down to Adolph Thomay, who moved the refrigerator with him when he relocated to his house in Cleveland where the refrigerator was picked up for recycling. Thomay’s refrigerator was one of thousands of refrigerators and freezers picked up throughout Ohio during a joint effort between utilities to find the oldest functioning fridge in the state. In addition to uncovering the state’s oldest working refrigerators, the campaign succeeded in saving the state a significant amount of energy by removing these and many younger, but still outdated, appliances from the electric grid. Customers of Efficiency Smart’s participating municipal electric systems can save money by recycling older, inefficient appliances. To take advantage of the initiative, customers can call 855-695-5296 or visit www.efficiencysmart.org. Appliances recycled must be secondary units, in working order, and between 10 and 30 cubic feet. Recycling refrigerators and freezers creates many benefits for utility customers and the environment. Many people don’t realize older refrigerators and freezers can use up to three times more energy to run than newer models built to higher energy-efficiency standards. By recycling a unit, participants can save as much as $150 a year through lower electricity costs by not operating an older refrigerator or freezer. Units picked up through the initiative are transported to an appliance recycling facility operated by JACO Environmental. JACO safely removes hazardous materials from the old energy-guzzlers, reclaiming 95 percent of the materials in the appliances for reuse in manufacturing new products. Even the foam insulation is safely incinerated to generate electricity. Efficiency Smart’s services include rebates for energy-efficient residential products; free removal of old, inefficient refrigerators and freezers from homes; and rebates for more than 90 energy-efficient products and services for businesses. Efficiency Smart also offers technical assistance, account management services, and customized financial incentives for large commercial and industrial customers. Efficiency Smart was established by American Municipal Power for the benefit of its member communities. It is administered under contract with the Vermont Energy Investment Corporation. Operations are based in Columbus, Ohio.